With ample warnings from various sources, we’ve been preparing for more rain. Wednesday and Thursday brought 1.5” here on Dry Creek which peaked @ 233 cfs Wednesday night—all quite tame—so far. 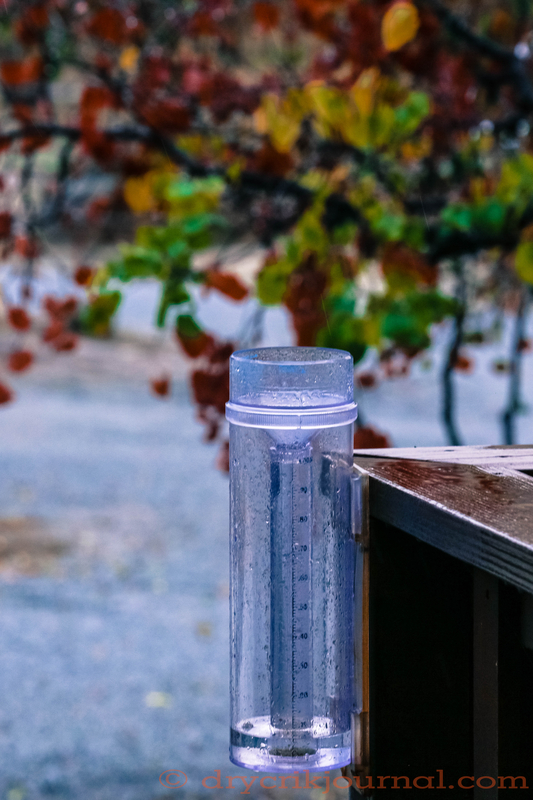 The ground was saturated after 5” of rain in December, a third of our average annual rainfall, and most all of what may be coming our way will end up as runoff. The byword all week has been ‘atmospheric river’ with various amounts of rain forecast for the next ten days that range from 5-15”. Low snow levels in our Sierra Nevada mountains down to 4,000’ from the last storm, now await a large warm storm slated to arrive tomorrow morning and last through Monday with rain up to an elevation of 9,000’, bringing the real risk of some downstream flooding. Though the high-end rainfall projections may be hearsay from the local doughnut shop, they spark memories of past years when we weren’t able to cross Dry Creek for weeks. Speculating beyond that is unnecessary, but the beekeeper who parks his hives along the creek for the winter moved them all to higher ground last night. What we do know is that the Dry Creek channel is laden with deadfall since the last four years of drought, with many dead-standing oaks and sycamores along its banks. The last channel-cleaning was in 1997 when Dry Creek peaked near 7,000 cfs and tipped the brush catchers over across from the house. We can be sure that every barbwire watergap between neighbors and pastures will be gone, cattle free to graze the canyon from Badger to Lemon Cove and points beyond. This morning we’ll be cleaning gutters and culverts, testing the backup generator, and ensuring that our cows and calves, that have yet to be branded, won’t be trapped on the wrong side of the creek. It may be one of those years when the calves are big and help from the neighbors hard to come by, but we’re all in the same boat—launching tomorrow. This entry was posted in Photographs, Ranch Journal and tagged flood, rain. Bookmark the permalink. Thank you. We’ll see how it all shakes out, a far cry from our 4-year drought. Well, I wonder what Rain has done to make Sky so angry? Perhaps she starched his shorts. I guess she will have some time to be with Mountain but with most of the wet stuff as run off will he benefit? Hasta la vista, I am digging ditches, cleaning out culverts. My goodness. Its a feast or famine world.